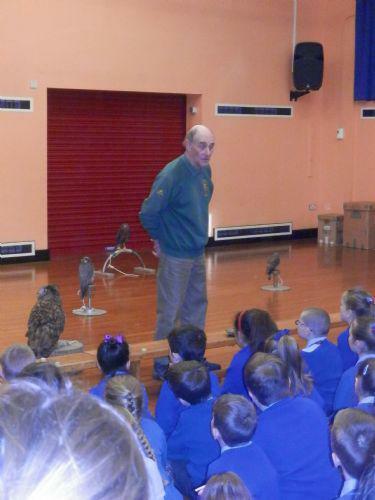 "This morning, Mike from the birds of prey company in Wales came to our school to show us and teach us about the amazing birds they have. There were different species such as the Lanner Falcon, the Kestrel, the Red-Tailed Hawk, the Eurasian Eagle-Owl and the African Spotted Eagle-Owl. One boy and one girl from each class were given the opportunity to hold some of the birds! The Eurasian Eagle-Owl was fascinating. It flew around the hall and over the heads of the first two lines of children. Three of the birds had a little wee!! It was very funny and I thought the African spotted-eagle owl would never stop! My favourite part was when I was allowed to hold the Kestrel. It was incredible to see one up close."